What do you see in this photo? Look closely. If you could touch it, what would it feel like? If you could hear it, what would it sound like? If you could watch it move, what would it look like? Last week one day I decided to try hard to hear, feel and watch my world–closely. It was a writing exercise I read about. Observe your world, be in the moment. Listen, watch and learn. Then express it in words as clearly as you can. It was difficult. I didn’t realize how preoccupied and cluttered my thinking was. I’m trying, but I still get in my own way. It hummed, it rumbled, it whirred, it mumbled low in the distance. It went errrrr, and woosh, and fump. It wooooooed, it thumped, it bumped. It talked incessantly. It sang like a radio. It clinked, it clanked, it clunked. It creaked, it grunted and groaned. It wargled, yes it actually wargled. It went kathunk-thunk-thunk. It chattered , it blabbered, it rattled off a hundred questions requiring a thousand replies, but no real answers. Blue-white shafts of light streamed through mottled grey-blue clouds. Puffy white lumps of fiber-fill parted to reveal cornflower blue sky. A bent and growly woman, white and grey, scowled at me. The saggy creases on her face shook, her eyes accused–You’re late! A satin black butterfly flew into my grill, kamikaze insects committed suicide on my window. Thousands of cars passed, this way and that, or sat glittering in the sun in hundreds of parking lots. A vulture–no three–soared and circled, and circled, mounting high and dropping low. The sooty odor of exhaust stinging my eyes and nose. The sulphurous tar of hot pavement wafting up. The icky sweet odor of dried urine. Meaty, smoky barbecue from the local burger joint. Wet dog shampoo. Sour laundry left too long in the washer. The potpourri scent of a craft store. The musty smell of age. This exercise was enlightening. I recommend it for writers. For anyone. What does your world look, feel, sound and taste like. I didn’t get to the taste or touch part. I was overwhelmed enough by the other three senses. And I didn’t have time. Hmm, wasn’t that the point of the exercise. It is difficult for me, and probably most of us I’d venture to say, to actually be “in the moment” so totally. Maybe it’s weird but I can see this making us better writers. Even if it is sort of zen-like. Oh, and the picture above? 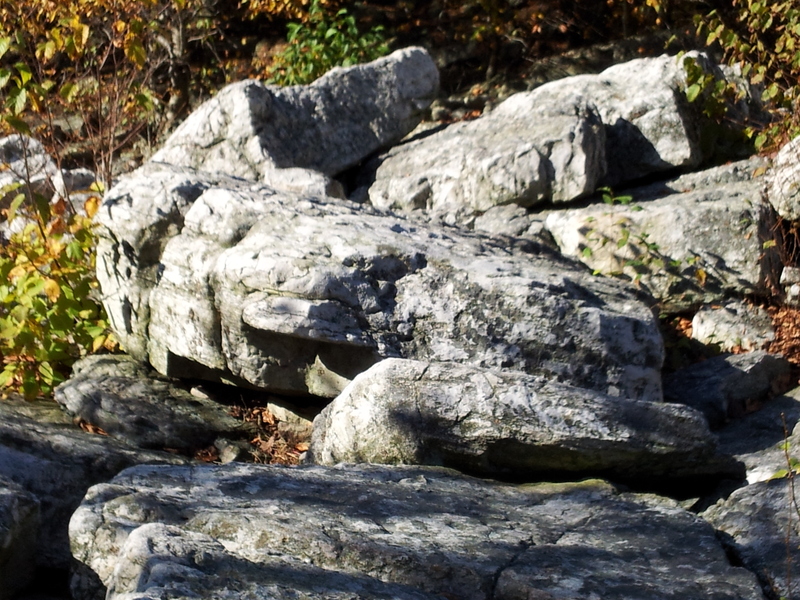 It’s just a rock, or rather a bunch of rocks piled together. I took the photo on a hike in the woods in south central Pennsylvania with my fiance. I see an alligator crawling away from us. Which is exactly the way I’d want to see an alligator!